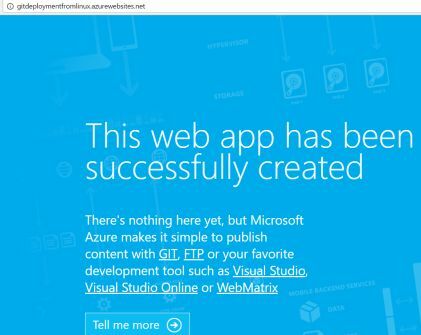 In this article, you will learn about automating the deployment of ASP.NET Core to Azure App Service, from Linux. On Microsoft Windows operating systems, using great tools like Visual Studio, it is extremely easy to upload and publish your web application projects to Microsoft Azure; but what about other platforms such as Linux? Microsoft has recently released PowerShell as an open source project, which is a great tool to be used in the cases where you have developers who understand and use PowerShell. But, if you don't happen to have any such developer, you would need to stick around the traditional tools and sometimes, they will require you to manually perform these changes. In this post, I am going to cover the teams who are using Git repositories for their projects and I will cover how they can basically automate the publishing of their projects after each successful build. On Linux, we can basically create small scripts that run in the background just like PowerShell or the Windows Command Prompt terminal's batch files. Git programs are required for this to run. 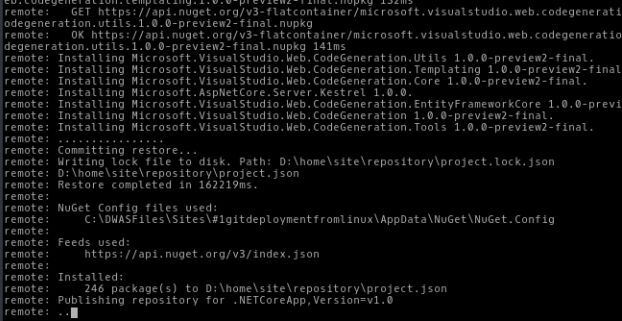 Actually, what I am going to show in this, is to execute the same commands but in a manner that most of the repository's information is already built, the commit message is updated, and the content is published to the Azure app service. The purpose of this guide is to make the entire process as easy to understand, as A, B and C. I will be using a real world application to show you how to do what and where instead of talking generally about many things at the same time. Before moving forward, a very little knowledge of how Git system works is required from you because some things might get a bit technical in the post below, and thus you must have the knowledge of how Git systems work, in order to control the versioning of files. 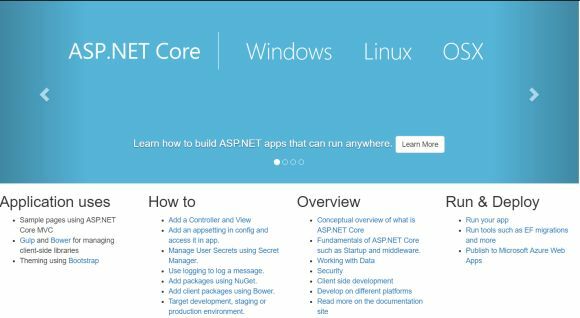 Secondly, you are required to know how you can use "dotnet" script to create, build and run the .NET Core applications. If you don't know .NET Core, I will reference to a few of my own beginner-friendly articles which you can read to learn more on this. Finally, you are required to have an active Azure account with a working subscription. If you don't happen to have one, you can get a free account with $200 credits to try out all of Azure! Once these requirements are met, you can continue to actually use the article for something useful. This part has been shared and taught many times, on many occasions. I wrote an article, on the same concept, a few days ago and I would like to refer that article to you to learn how you can create a new application with web template in .NET Core. Creating and hosting ASP.NET Core application on Linux — Nothing Third-Party. Read this article for a complete overview and a walk-though of the concept of building and running the applications on the Linux environment. I will move onward from this step, because you must be aware of the ways of creating your own applications. Now, comes the main part. This article entirely focuses on the deployment of applications to Microsoft Azure instead of developing an application. There would be some parts where I will be modifying the parts, but that is just to tell you how easy it would be to re-deploy the application using the automation, by executing a simple command. Although it is not required, but you are required to have a very basic introduction to automation tools. You can get a good tutorial about these "toolings" easily from any software engineering guide. Microsoft Azure uses many methods and ways to deploy the applications on the cloud, such as using Visual Studio to deploy the applications and leave the configurations to the tool itself. However, since Linux environments don't have Visual Studio, most of the tasks are left with source control tools (Visual Studio Code also uses the same git programs to upload the code to repositories). I will show you how you can create a minimal script or a program that manages all of these tasks for you -- automation program. On Linux, mostly and typically, git comes pre-installed in most of the Linux-distributions, such as Ubuntu, etc. However, if that is not available, you can easily install it using. Or using a similar command, such as using yum etc. This would install and setup the git for your environment. Once you have git installed, you need to set a few things up. Git requires the name and email address for notifying who made a change to the system. So for that, we would require to execute the following commands. You should pass the name and address values that you hold - I used Eminem and a random email address. And to check if your personal configurations are done correctly, you can execute the following command to test that. Once you have that, you can continue forward and actually set up repositories to deploy the application. I used the following information while creating a new service, so that, if I use a name, you should know where did that come from. It shows that you can deploy your web applications, from many sources, using many services such as FTP, Git etc. I will show you how to do this using Git... There are a few other things that I would like to show you here. I will also show you how to test the build integrity -- whether build succeeds or not. I will also show you whether git considers to commit and push the changes to the server or not. So, these are a few of the tests that I have prepared for the automation tool that will be helpful for us in this case. These things are not provided on the tutorials that are available online. They are just simple straight-forward ones which only show you how to do it, not whether it is helpful to do it at all. On the machine side, the first thing to do is to set up a local repository for git deployments. Even if you have created a project, you can still create a repository for that project and then, use it as the source for your application's content. So, for that, the following commands would work. This would create the project, set up the repository for us under .git directory. On my machine, the following was the result of this. Not visible at the moment, however, there is a special file called .gitignore, created by default and that contains really helpful ignore constraints for the git systems. However, we will look into them later as we progress. We can now set up a few remote repositories on own local machine so that once we need to publish the application, we don't have to enter the URL of the repository every time. Instead, what we can do is, just call that alias of the repository and deploy the content there. This helps to notify the system of the locations where it needs to push the changes to. 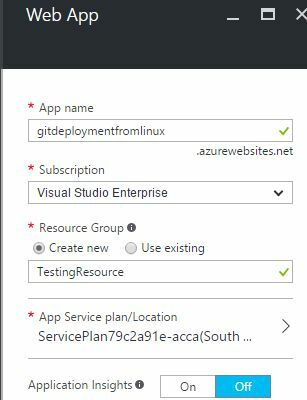 For that, first of all we need to setup our online repository to allow Local Git Deployments from Microsoft Azure; and only then, we can assure that we can send the code to the repository online. For that, head over to Deployment options → Deployment source → Local git repository. You can see that there are other options available too, select as required and wanted. I selected the third option so that we can publish the source code from our local machines to the servers in no time at all, without having to need any third-party vendors. You need to set up the credentials, so that when you are trying to publish the applications, only you are the one in charge of pushing the changes to the server and not anyone else. Note a few things in the previous command, the few things interesting here are that the repository always contains the name of your application service in the URL as well as in the resource file for your git processes. You need to update that, secondly, you need to update the username in the URL and as the one you used in the credentials (I used "afzaal" there). Once this is done, we can move onwards and actually push our first version of application to see, how Azure will behave. $ git commit - m "Some random commit message here..."
In the previous commands, the first one takes care of the addition of files to the local tracking of the repository, to track the files that need to be. Second command simply commits the changes and finally a push is made to the "repoinazure", of course that is the repository where we will publish the application to. 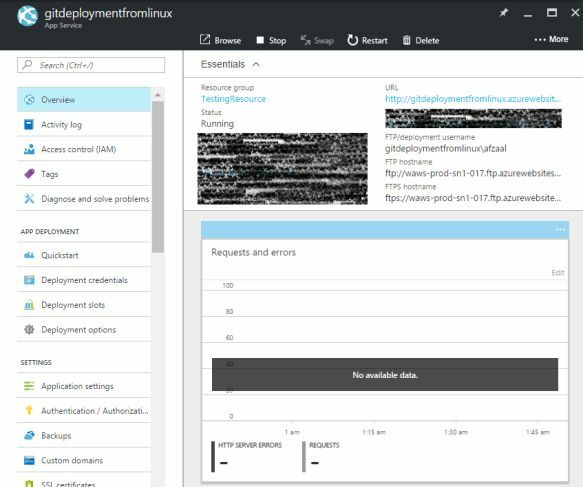 The following is a screenshot of a process going on, during the first deployment. Next times and onwards it doesn't take this much time and is very much simpler. Let us add a simple controller to this web application, and then quickly deploy that using the script that we will create to do the trick for us. In this section, I will show you a simple ASP.NET Core Web API that will be used to basically see, how early an updates get published live on the server. So, I start with adding a new controller file to the web application's source code and then modifying it to return a few objects with some data. This would check if we are passing the remote repository or not, it will also build the project and then continue only if build succeeds. So, basically, this comes in really handy when working with a terminal based environment, especially Linux, and using the git protocol for deployment. I recommend saving this as a file in your local repository, and then executing it from the terminal as a program. You can get the file from my GitHub repository too. Once this is done, simply create it as executable and then finally execute the script to deploy it. It will go through each step and it will finally deploy the application, it would require password. I did not create the script to accept the password. Clearly we can see that now our most recent version of the deployment is being shown as the active deployment and the previous one is removed and set as Inactive. We can do deeper into them and change their status as needed but I won't be doing that at all. Remember: Next time you want to publish the application, just use that script I provided. However, my major concern was to show how you can use the git, in a script-based environment to deploy the applications to Azure and also track when each commit gets pushed to the server. As you can see in this post, the commits are tracked on the cloud and you can change and select which commit you are interested in and set them as the active ones -- such as in the case of a deletion of a file.